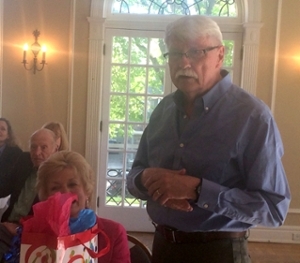 A reception was held on May 13, 2015 in honor of Professor and former Chair Robert Benson's retirement. Miami and Oxford community members gathered at the Oxford Community Arts Center to celebrate Bob's years of service at Miami University. Benson came to Miami in 1985 and became Chair in 1992—a position he held for 15 years. He also served briefly as Interim Dean for the former School of Fine Arts. Benson served as the director of graduate studies in the department, taught architectural history, and more recently, seminars on Frank Lloyd Wright. Bob remains as an active composer and organist, with over 100 published works in choral and organ compositions. He currently serves on the Planning Commission and the Historic Architecture and Preservation Commission for the City of Oxford and is on the Design Review Committee at the University of Cincinnati.